Chvrches (pronounced "churches"; stylised as CHVRCHΞS) is a band from Glasgow, Scotland, formed in September 2011. The band consists of Lauren Mayberry, Iain Cook and Martin Doherty. Mostly deriving from the synth-pop genre, Chvrches also incorporate indietronica, indie pop, and electronic dance into their sound. Two years after their formation, Chvrches in March 2013 released Recover EP, which included hits "The Mother We Share" and "Recover". Their debut studio album, The Bones of What You Believe, was released on 20 September 2013, while the band was ranked fifth on the Sound of 2013 list by the BBC. Two years later, on 25 September 2015, the group released their second album, Every Open Eye. Their third album, Love Is Dead, was released on 25 May 2018. In 2003, musicians Iain Cook and Martin Doherty met as students at the University of Strathclyde in Glasgow. Doherty was a member of the rock band Julia Thirteen, and asked Cook to produce some of the band's music. Although Julia Thirteen never recorded any further material, the experience proved vital, as Cook and Doherty formed a mutual partnership through music. A few years later, Doherty joined Cook as a member of the alternative rock band Aereogramme, but the two quit in 2007 when they became frustrated with the band's sound and lack of exposure. Doherty was then offered a role as a touring member of The Twilight Sad, but quit in 2012 after growing tired of playing someone else's music. The two had become jaded with alternative rock, and decided to start their own music project. A few years after Cook left Aerogramme, he began listening to the American electronic music band Emeralds. Inspired, Cook bought a Minimoog Voyager and began "playing around with soundscapes and stuff like that...kind of with a view of doing stuff from the '80s". In September 2011, he produced an extended play for the band Blue Sky Archives, and asked vocalist and drummer Lauren Mayberry if she would be interested in singing backing vocals for an electronic music project he and Doherty were working on. Mayberry was intrigued by the offer, as neither of them had any background in electronic music. "For me it was nice to write over different instruments and not have to try to sing and scream over live drums and a Marshall bass stack," said Mayberry. The three musicians quickly bonded, and spent the next few months writing and recording songs in a basement studio. During these sessions, Mayberry wrote the lyrics and hooks, Doherty provided melodic ideas, and Cook produced the songs. Once the sessions had concluded, the three decided that they worked well enough together to try and perform the songs as a band. The initial plan was to have Doherty sing lead vocals, while Mayberry would sing backing vocals. Mayberry was eventually promoted to lead vocalist after Cook and Doherty heard her singing abilities. In addition to her new role, Mayberry became the band's frontwoman, and gave the other members a reading list about the inner workings of the music industry. The band members settled on the name Chvrches (stylized as CHVRCHΞS), which uses the Roman letter "v" instead of a "u". This spelling was chosen to differentiate themselves from actual churches in online search results. There was no conscious decision to have a name with religious connotations; instead, the band members felt that the name gave "a strong vibe that could be interpreted in many different ways". Mayberry also noted that the v is a subtle nod to band names from the influential witch house genre of music, including bands such as SALEM and Ritualz. "We did consider putting upside down crosses at either side of our name, but that would have dated us, I think" said Mayberry. 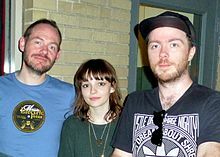 Doherty noted how Chvrches began as a studio only project, saying: "There wasn't really any goal other than to put a song out on the internet and see what kind of response we got". On 11 May 2012, Chvrches posted its debut song "Lies" on the Neon Gold Records blog. Instead of a picture of the band members, the song was accompanied by a picture of nuns in masks, which added to the perceived religiosity of the Chvrches name. The response was almost immediate; "Lies" reached number one on the MP3 aggregate blog The Hype Machine, and similarly received constant airplay on SoundCloud and BBC Radio 1. The band members were amazed by the reaction to "Lies". "It was unbelievable, way beyond what we expected," said Doherty. Despite the popularity of "Lies", Chvrches had yet to perform a live show. There was a growing expectation that the band would eventually perform live, although the band members were anxious at the prospect. To curtail this fear, Chvrches played its first two live shows under the name Shark Week, before making its official debut at the Glasgow School of Art in July. When Chvrches began to attract A&R representatives, Mayberry was dismayed that most of them wanted to make her the central figure of the band; one representative called her the next Pixie Lott. From the beginning, the band's goal was to give equal treatment to all three members, and to not have any one person become the focal point. As Doherty stated: "We could have sold 200,000 more albums if we'd hidden Iain and I from view and put Lauren on the cover of every magazine. We ended up doing it in an indie band style. We broke through via word of mouth. It was about doing it in an honest, right way." This mentality meant that the band had to decline early offers for photo shoots and interviews that excluded Cook and Doherty. Chvrches had already recorded eight other songs by the time "Lies" was released, in case listeners wanted to hear more music. One of these songs, "The Mother We Share", was released on 5 November 2012 as the band's debut single. "The Mother We Share" was similarly well received by listeners, and was downloaded more than 32,000 times by September 2013. Around this time, Chvrches co-manager Campbell McNeil attempted to contact Glassnote Records founder Daniel Glass, and gave Glass copies of "Lies" and another song called "Recover". After traveling to the UK to see Chvrches live, Glass signed the band to a recording contract in January 2013. To promote Chvrches, managers McNeil and Danny Rogers launched a nonstop touring schedule which included several international performances. Two months after signing with Glassnote, Chvrches made its North American debut at the South by Southwest festival in Austin, where the band won a Grulke Prize for best non-American act. On 6 February 2013, Chvrches premiered the second single "Recover". It was followed by Recover EP, out on 25 March 2013 in the UK via Goodbye/Virgin and 26 March 2013 in the US via Glassnote. On 13 March 2013 Chvrches performed at SXSW. They also won the Inaugural Grulke Prize (for Developing Non-US Act) at SXSW. On 19 June 2013, Chvrches made their US TV debut performing "The Mother We Share" on Late Night with Jimmy Fallon. On 15 July 2013, they released the single "Gun". In July 2013 Chvrches supported Depeche Mode on four shows from The Delta Machine Tour 2013. In September 2013, they also performed "The Mother We Share" on Later... with Jools Holland. On 20 September 2013, the band released their debut studio album The Bones of What You Believe on Virgin Records. On the critical aggregator website Metacritic, the album received a score of 80, based on 39 reviews. On 30 September 2013, Mayberry penned an op-ed piece in The Guardian on the sexist remarks directed towards her through the band's social media sites. Chvrches covered Bauhaus' song "'Bela Lugosi's Dead" for the ending credits of the film Vampire Academy: Blood Sisters. "The Mother We Share" was featured in the opening video for the 2014 Commonwealth Games Opening Ceremony in Glasgow, Scotland, on 23 July 2014. The band started recording their second album in January 2015, and on 5 June 2015 announced they had completed work on it. Recording was conducted in the same Glasgow facility used for The Bones, which received a major upgrade to recording gear and an increase in the instrumental variety for the second album. On 16 July 2015, the band revealed the release date, cover art and track listing for the new album, entitled Every Open Eye. The following day they released the album's first single, "Leave a Trace". The album was released on 25 September 2015. On 12 August 2015, the second single "Never Ending Circles" was released on YouTube, and on 10 September 2015 the third single "Clearest Blue" was also released on YouTube. On 19 October 2015, the fourth single "Empty Threat" was released. The music video was revealed on 20 November 2015 through YouTube. Chvrches and Solar Fields penned the original song "Warning Call" for the 2016 video game Mirror's Edge Catalyst. The theme song was released on 13 May 2016. In June 2016, a new version of "Bury It" featuring Hayley Williams was released the fifth and final single from Every Open Eye. The music video for the song was illustrated by Jamie McKelvie, featuring the trio and Williams demonstrating telekinetic powers. Chvrches began work on their third album in February 2017 in Los Angeles. On 24 February, Dave Stewart of Eurythmics posted on Twitter that he was in the studio working with the band. On 12 December, it was announced that Greg Kurstin had produced the album, and that work on the project was nearing completion. On 1 January 2018, Doherty confirmed that the album would be released in some time the following year. In January, Mayberry stated in an interview that the album would be titled Love Is Dead, and announced "Get Out" as the first single from the album. The song was released on 31 January 2018. Speaking about the album in an interview, Mayberry said "It's a typically Glaswegian thing to do, to feel the most misanthropic and macabre when you're in the sunniest place on earth." To promote the upcoming album, the band wiped all of their social media pages, before posting a short video containing new music captioned "GET IN". The post was accompanied by a link to a Facebook Messenger page with the band. On 31 January 2018, BBC Radio 1's Annie Mac announced "Get Out" to be her Hottest Record in the World, giving the single its world premiere. The album also includes a song titled "My Enemy" featuring Matt Berninger of The National, released 28 February. The track list was unveiled on 26 February 2018. On 29 March, the band released "Never Say Die" as the third single from the album. On 10 April, the band released "Miracle" as the fourth single from the album. On 9 October, the band released "Graffiti" as the fifth single from the album. In February 2019, the band was featured in a collaboration with the BBC Scottish Symphony Orchestra for the launch of the new BBC Scotland television channel. The channel's official launch on 24 February featured an orchestral performance of "Miracle". In March 2019, the band collaborated with EDM artist Marshmello on the track "Here With Me". Known for their clean sound, Chvrches' music style is usually tagged as electronic or synthpop. Neon Gold described their sound as "a godless hurricane of kinetic pop energy". Kitty Empire of The Observer wrote they "make accessible electro-pop that's only just short of truly brilliant". Wired noted following Every Open Eye's release that the album "cements the group as today's heir apparent to Depeche Mode, New Order, and other titans of British electronic music." The band stated that their heroes were David Bowie, Depeche Mode, Iggy Pop, Siouxsie and the Banshees, Tangerine Dream and Nick Cave. They are also influenced by acts such as Madonna, Eurythmics, Throbbing Gristle, Prince, Tubeway Army, Robyn, Laurie Anderson, Kate Bush, Cocteau Twins, Death Cab for Cutie, Orchestral Manoeuvres in the Dark, Cyndi Lauper, Whitney Houston and Elliott Smith. The band writes, records, mixes, and masters their songs in a basement studio in Glasgow. When Chvrches plays live, Mayberry performs lead vocals and occasionally plays synthesisers and samplers. She also played drums as a part of their second album tour as seen in "Playing Dead", "Empty Threat", and "Under the Tide"; Cook plays synthesisers, guitar, bass, and also performs backing vocals; Doherty plays synthesisers and samplers, and also performs backing vocals and sometimes lead vocals. In 2018, the band's live line-up expanded to a four-piece by adding Jonny Scott on drums. Chvrches tour globally and are active in the festival circuit, including Firefly Music Festival, SXSW, Music Midtown, Field Day, Canadian Music Fest, Sasquatch! Music Festival, The Great Escape, Longitude, Pitch Festival, Thrival Festival, T in the Park, Electric Picnic, Melt! Festival, Summer Sonic, Pukkelpop, Lowlands, Reading and Leeds Festival, Coachella, Osheaga, the V Festival, Lollapalooza, Sziget Festival, Bonnaroo, and Glastonbury. Chvrches was the opening act for Discopolis, Chew Lips, School of Seven Bells, Passion Pit, Two Door Cinema Club. They also supported Depeche Mode during their The Delta Machine Tour 2013 at Nîmes (16 July), Milan (18 July), Prague (23 July), and Warsaw (25 July). Some of the artists that opened for Chvrches were Dan Croll, MØ, Isaac Delusion, Mansionair, Young Fathers, Arthur Beatrice, Conquering Animal Sound, Still Corners, City Calm Down, XXYYXX, Basecamp, THUMPERS, and The Range. On 3 December 2015, Chvrches performed Leave a Trace at The Game Awards 2015 in Los Angeles, California, where they also announced the nominees for and winner of best indie game. The band played the Bonnaroo Music Festival in June 2016, in Manchester, Tennessee, and Flow Festival, mid-August 2016, in Helsinki, Finland. In October 2018, the band played Austin City Limits Music Festival. In December 2018 & January 2019, the band played Falls Festival in Australia. ^ Lester, Paul (26 June 2012). "New band of the week - Indie - Churches (No 1,295)". The Guardian. Retrieved 20 December 2018. ^ Phares, Heather. "Chvrches". AllMusic. Retrieved 18 October 2014. ^ "Get 'Lost in Music' with John Meagher". The Irish Independent. 18 July 2014. Retrieved 26 April 2016. ^ "CHVRCHES announce summer tour". Consequence of Sound. 25 March 2013. Retrieved 26 April 2016. ^ "【SUMMER SONIC 2013】 CHVRCHES 初来日スタジオ出演 （20130810）". YouTube. 20 February 2016. Retrieved 27 September 2017. ^ "BBC – Music – CHVRCHES". Bbc.co.uk. Retrieved 16 December 2018. ^ "Chvurches", interviewed by Shad Kabango on the radio-television program Q, Canadian Broadcasting Corporation, 17 January 2016. ^ a b c "BBC News – BBC Sound of 2013: Chvrches". Bbc.co.uk. 31 December 2012. Retrieved 31 December 2012. ^ "Chvrches tease their return with snippet of new track". NME. 30 January 2018. Retrieved 1 February 2018. ^ Arroyo, Steven (22 September 2013). "Chvrches: Catching the Light". Consequence of Sound. p. 2. Retrieved 5 June 2018. ^ Knopper, Steve (22 October 2015). "Chvrches slows down a bit to gain perspective". Chicago Tribune. Retrieved 5 June 2018. ^ a b c d e Fink, Matt (19 November 2015). "Chvrches - The Under the Radar Cover Story". Under the Radar. Retrieved 2 October 2017. ^ a b Stern, Marlow (10 July 2013). "Chvrches Is the Most Addicting Band of the Summer". Newsweek. Retrieved 28 August 2017. ^ a b c Cosores, Phillip (6 December 2013). "Chvrches: The Best of What's Next". Paste. Retrieved 2 October 2017. ^ a b Wolfson, Sam (13 June 2013). "Chvrches: Music for the masses?". The Guardian. Retrieved 28 August 2017. ^ Savage, Mark (31 December 2012). "BBC Sound of 2013: Chvrches". BBC News. Retrieved 31 December 2012. ^ Gieben, Bram H. (11 September 2013). "Chvrches: 'We're not in the business of writing chirpy pop songs'". The Skinny. Retrieved 28 August 2017. ^ a b Ken, Wong Boon. "Chvrches interview". Time Out. Retrieved 6 June 2018. ^ Lester, Paul (26 June 2012). "New Band of the Day – No 1,295: Churches". The Guardian. Retrieved 3 October 2017. ^ Barker, Emily (11 November 2014). "35 Massive Bands Recall The Story Of Their First Ever Gig". NME. Retrieved 3 October 2017. ^ a b Nicholson, Rebecca (20 August 2015). "Chvrches: 'We could have sold 200,000 more records if we hid us boys out of view'". The Guardian. Retrieved 28 August 2017. ^ Pollock, David (25 October 2012). "Interview: Chvrches on Prince and being Scottish music's next big thing". The Scotsman. Retrieved 6 June 2018. ^ Cragg, Michael (19 September 2012). "New music: Chvrches – The Mother We Share". The Guardian. Retrieved 3 October 2017. ^ a b Lipshutz, Jason (16 September 2013). "Chvrches' Hype Dreams: Can Blog Buzz Produce A Hit Album?". Billboard. Retrieved 3 October 2017. ^ "Haim, Chvrches, Flaming Lips Are Winners Of The Inaugural Grulke Prize At Sxsw 2013". Contactmusic. 20 March 2013. Retrieved 6 June 2018. ^ "Chvrches: Recover – Tracks – Pitchfork". Pitchfork Media. Retrieved 6 February 2013. ^ "SXSW 2019 Schedule". SXSW 2019 Schedule. Retrieved 16 December 2018. ^ a b "Grulke Prize Winners". SXSW. Retrieved 18 February 2017. ^ Levine, Nick (11 July 2013). "Chvrches unveil tracklisting for debut album 'The Bones Of What You Believe'". NME. ^ "BBC Two – Later... with Jools Holland, Series 43, Episode 2". Bbc.co.uk. 27 September 2013. Retrieved 21 November 2013. ^ "The Bones Of What You Believe". metacritic.com. Retrieved 28 September 2013. ^ Mayberry, Lauren. "Chvrches' Lauren Mayberry: 'I will not accept online misogyny'". The Guardian. Retrieved 1 October 2013. ^ "Vampire Academy Movie Soundtrack: Cover, Release Date, Track Listings". Dhampirlife.com. 22 January 2014. Retrieved 30 May 2015. ^ a b c McFarland, K. M. (October 2015). "Second Coming: Chvrches eyes a Bright Future". Alpha Music. Wired. Condé Nast. p. 40. ISSN 1059-1028. ^ "Chvrches – "Leave A Trace"". Stereogum. ^ "Listen to Chvrches' New Song "Warning Call" From Mirror's Edge Catalyst | Pitchfork". pitchfork.com. Retrieved 17 October 2016. ^ "CHVRCHES and Paramore's Hayley Williams team up on "Bury It" — listen". Consequence of Sound. 9 June 2016. Retrieved 6 May 2017. ^ "When you were trying to document the first day of writing for album three but your camera jammed and you only fixed it once you got home. #CHV3". Instagram. ^ "Dave Stewart on Twitter". Twitter. Retrieved 6 May 2017. ^ "Chvrches' Lauren Mayberry breaks down their new LP: 'It's the most pop stuff we've done'". EW.com. Retrieved 13 December 2017. ^ martin (12 December 2017). "We are currently putting the finishing touches on "the most aggressive and vulnerable" album we've ever made". Twitter. Retrieved 13 December 2017. ^ "It's 2018. This year we (chvrches) will release an album and play many shows. It feels good to say that". Twitter. 1 January 2018. Retrieved 3 January 2018. ^ "Love Is Dead - CHVRCHES". 23 January 2018. ^ "SCHATTENBLICK - LABEL/4807: Polydor/Island- und Vertigo/Capitol-Presse-Newsletter - 17.01.18". Webcache.googleusercontent.com. Retrieved 16 December 2018. ^ Savage, Mark (1 May 2018). "Chvrches: 'The punk rock Joan of Arc of pop'". Bbc.co.uk. Retrieved 16 December 2018. ^ "Chvrches Share Cryptic New Video: Watch | Pitchfork". pitchfork.com. Retrieved 30 January 2018. ^ "Chvrches tease their return with snippet of new track". NME. 30 January 2018. Retrieved 30 January 2018. ^ "CHVRCHES Are Teasing New Music via Facebook Messenger". pastemagazine.com. Retrieved 30 January 2018. ^ Trendell, Andrew (26 February 2018). "Get ready for a new CHVRCHES' song featuring The National's Matt Berninger". NME. Retrieved 26 February 2018. ^ "Listen to Chvrches' New Song "My Enemy" With the National's Matt Berninger | Pitchfork". pitchfork.com. Retrieved 29 March 2018. ^ Blais-Billie, Braudie (26 February 2018). "Chvrches Tease New Album Title, Tracklist". Pitchfork. Retrieved 27 February 2018. ^ "Chvrches – "Never Say Die"". Stereogum. 29 March 2018. Retrieved 29 March 2018. ^ Smith, Aidan (25 February 2019). "BBC Scotland opening night review: Variety the spice of life for new channel". www.scotsman.com. Retrieved 25 February 2019. ^ Trendell, Andrew (25 February 2019). "Watch Chvrches' stunning performance with orchestra to kick off BBC Scotland". NME. Retrieved 25 February 2019. ^ Empire, Kitty (1 March 2013). "Chvrches- review". London: The Guardian. Retrieved 14 March 2013. ^ Murray, Robin (13 November 2018). "Chvrches announce Hansa Session ep". Clash magazine. Retrieved 13 November 2018. ^ Duncan, Bryan (1 June 2012). "On the Radar – No 207: CHURCHES". Radar. Archived from the original on 19 April 2015. Retrieved 18 February 2017. ^ Manes, Billy (30 September 2014). "Scottish trio Chvrches avoid the hype and bring the magic". Orlando Weekly. Retrieved 2 July 2015. ^ "26 Things You Should Know About Chvrches, Your New Favorite Electro-Pop Band". Buzzfeed.com. Retrieved 16 December 2018. ^ Connick, Tom (12 March 2018). "CHVRCHES have a drummer now". Nme.com. Retrieved 24 May 2018. ^ "CHURCHES TO PLAY CLUB NME THIS AUGUST - KOKO London". Koko.uk.com. Retrieved 16 December 2018. ^ "Artists". Flow Festival 12.-14.8.2016. ^ "Lineup". ACL Music Festival. Retrieved 16 December 2018. ^ "Falls Festival 2018/19 | The 26th Annual Music & Arts Festival". Falls Festival 2018/19. Retrieved 25 January 2019. ^ "The Rober Awards 2012 Music Poll - Rober Awards". Roberawards.com. Retrieved 16 December 2018. ^ "The Rober Awards 2013 Music Poll - Rober Awards". Roberawards.com. Retrieved 16 December 2018. ^ "CHVRCHES' 'The Mother We Share' has won the 2013 Twenty Quid Music Prize". Popjustice.com. 30 October 2013. Retrieved 21 November 2013. ^ "The Albums". Sayaward.com. 19 June 2014. Retrieved 6 August 2014. ^ "NME Awards 2014: All the nominees in full". 15 January 2014. Retrieved 6 August 2014. ^ "Brit Awards 2015 nominees". 15 January 2015. Archived from the original on 28 November 2015. Retrieved 16 January 2015. ^ "Rösta i GAFFA-Priset 2019". Gaffa.se. Retrieved 16 December 2018. 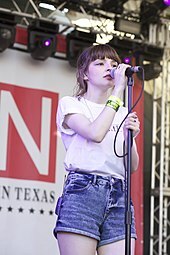 Wikimedia Commons has media related to Chvrches. This page was last edited on 25 April 2019, at 19:42 (UTC).